The Ninja Nexus Prism is an ancient artifact that contains the six legendary Ninja Power Stars and originally held the Ninja Nexus Star. It is also a forge for new Power Stars. 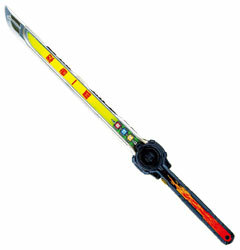 Prior to its crash land on Earth, the Ninja Nexus Prism was covered with Ninja Steel, an unique metal alloy that can be used to make new Power Stars. With the final battle against Galvanax, the Ninja Nexus Prism dissipates, thus turning all the Power Stars in the rangers' possession into dust. Ten years ago, the legendary Ninja Nexus Star resided in the Ninja Nexus Prism which crashed on Earth at the home of ninja master Dane Romero and his two sons, Brody and Aiden. After Dane removed the Star. When Galvanax attacked to steal the star, Dane used the star to shield himself and suddenly he was morphed into the Red Ranger. After Galvanax managed to blast the star away from him, he was on the verge of acquiring the Star's power when Dane took his sword and shattered it into six pieces. The six pieces then returned to the Prism and transformed into the Ninja Power Stars. The Ninja Battle Morpher is the morphing device used by the five core Ninja Steel Rangers. 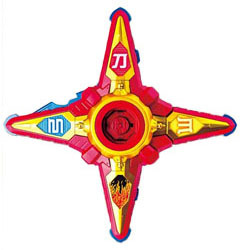 The Ninja Battle Morpher is able to convert into a larger Battle Mode after which it can change into three different weapon forms, all marked with their respective kanji. Morph Mode, which permits them to morph to their Ranger form by calling out "Ninja Spin!" before spinning the Ninja Power Stars. 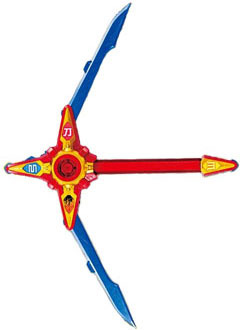 The Ninja Battle Morpher can be changed into Bow Mode, which allows any Ranger to fire energy arrows. 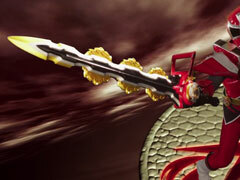 The Ninja Battle Morpher can be changed into a short sword called Blade Mode. The Ninja Battle Morpher can change into a tri-claw designed for swift stabs. The Ninja Blasters are the main firearms of the five Ninja Steel Rangers, modeled after a frog. 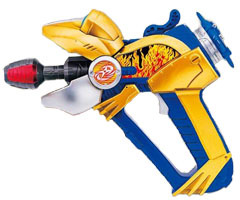 To activate the finisher, a Ninja Steel Ranger inserts a Ninja Power Star into the back of the gun, making the mouth open to reveal a barrel and the gun until the trigger is pulled, where the gun fires a laser that hones in onto the target. 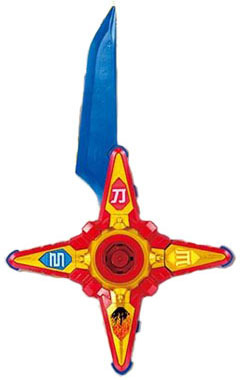 The Ninja Master Blade escorts Ninja Master Mode and is triggered when the Ninja Master Mode Star is spun on the Ninja Star Blade. While primarily a sword, it has a chainsaw design. 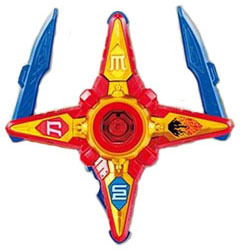 To activate the finisher, the Ranger pulls on the ripcord to spin the three throwing star buzzsaws on the blade section. The Ninjacom is the Ninja Steel Rangers' primary method of communication. With the device, the Rangers are able to contact with each other electronically. Mick and Brody created the Ninjacoms for the Ninja Steel Power Rangers to use. 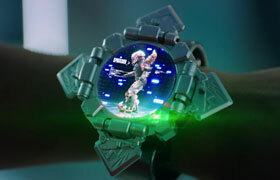 The Ninjacom appears to resemble a gray-colored wristwatch. It has a built-in speaker that allows one Ranger to contact the others. The Ninja Blaster Mode is extra armor the Ninja Steel Rangers don when they pilot the Megazords. The Rockstorm Guitar is the personal weapon of the Gold Ninja Steel Ranger, in which it combines three equipment types. The weapon itself has two modes in which to launch attacks and strums like an actual electric guitar. To utilize attacks, the dual-element Storm Star is placed right in the sound hole compartment of the weapon before strumming it to activate their corresponding attacks.